This is January’s edition of Comet Over Hollywood’s classic film references in music videos. In light of the hit film “Hugo” (2011) that pays tribute to French film pioneer George Méliès, I wanted to share the 1996 video “Tonight, Tonight” by Smashing Pumpkins from their album Mellon Collie & the Infinite Sadness. The film plays off the theme of “A Trip To The Moon & The Extraordinary Voyage” (1902) where people get into a strange flying contraption-this time something that looks like a zeppelin and not a spaceship- and flies to outer space. The flying vehicle passes the same moon from “A Trip to the Moon” that the spaceship flies into and the passengers meet similar space monsters as in the film. 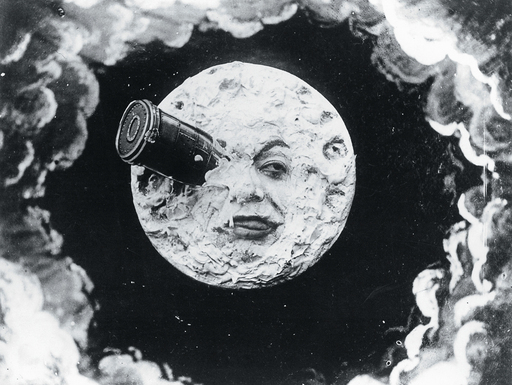 The video further pays tribute Méliès by having a scene with mermaids-referencing another short film he made-and having a ship float by at the end named the S.S. Méliès. The idea for the music video came from the video’s directors Jonathan Dayton and Valerie Faris because the album art for Mellon Collie & the Infinite Sadness reminded them of a silent film. The band was surprised by the music video’s success and fan response and it won six awards at the MTV Video Music Awards in 1996: Video of the Year, Breakthrough Video, Best Direction in a Video (Directors: Jonathan Dayton and Valerie Faris), Best Special Effects in a Video (Special Effects: Chris Staves), Best Art Direction in a Video (Art Director: K. K. Barrett and Wayne White) and Best Cinematography in a Video (Director of Photography: Declan Quinn). I am pleased to see that not only the recent film and this music video give him the recognition he deserves.